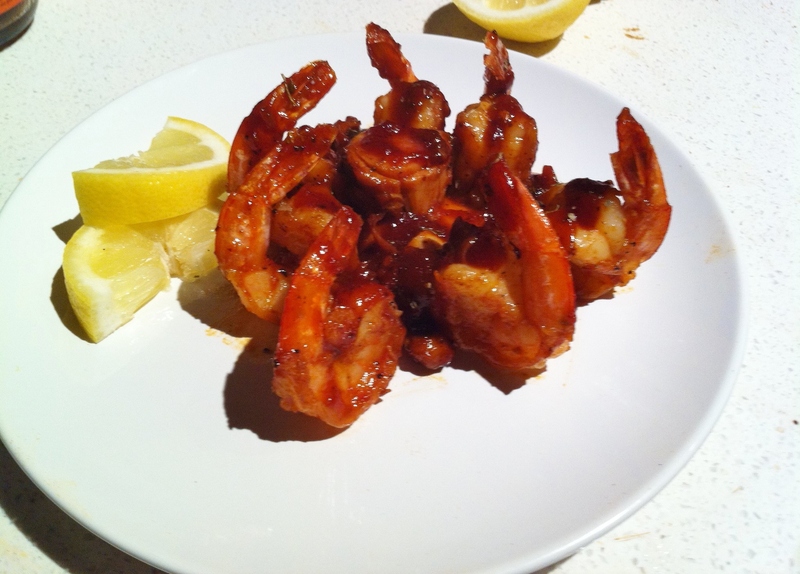 Shrimp & Octopus In a Bourbon And Black Pepper Sauce. Yummy!!! In a large skillet over medium heat, combine the onion, garlic, and whiskey. Simmer for 10 minutes, or until onion is translucent. Mix in the ground black pepper, salt, ketchup, tomato paste, vinegar, liquid smoke, Worcestershire sauce, brown sugar, and hot pepper sauce. Bring to a boil then reduce heat to medium-low, and add shrimp and simmer for 10 minutes, then add canned octopus and simmer 10-15 additional minutes. Remove shrimp and octopus with a slotted spoon and arrange 0n plates. Run sauce through a strainer if you prefer a smoother sauce and drizzle over the shrimp and octopus and garnish with lemon slices. Serve with a refreshing salad or side dish of your choice. Bon Appetit! Posted on August 15, 2011, in Seafood. Bookmark the permalink. 3 Comments. I love shrimps but not to sure about the Octopus. Is this a Spicy dish? I love spicy!!! It actually wasnt too spicy, balanced dish!